Image by asalga via FlickrTrending on twitter now and in other Social Media tools is the infamous "Anti-Planking Act of 2011". This was actually a law proposed by Quezon City Representative Winston Castelo which aims to penalize the act. Planking is is an activity consisting of lying face down in an unusual or incongruous location (Wikipedia). This has been one of the fads of protesting and has gained public attention during the transport stike last Monday. Of course netizens reacted quickly in their ire to the propoed law which many think is overly reactive. What is your opinion regarding the infamous "Anti-Planking Act of 2011"? Image by Danny McL via Flickr Just recently, Honda Cars Philippines Incorporated (HCPI) announced that they will be recalling several models of their popular car products including Honda Jazz, Honda City and Honda CR-V due to the issue on their power window master switch which can causes smoke issuing or worst partial burning of the window switch cover. Although no reported accident has been attributed to this, Honda is on its way to voluntary recalling those models affected and replacing it with countermeasure parts. In the Philippines, a total of 19,143 units of combined Year 2005-2007 Honda Jazz, Year 2006-2008 Honda City and Year 2005-2006 CR-V models are included in this safety measure. Honda Philippines said that they already began notifying affected customers via mail. If you didn't receive a mail or unsure whether your unit is included in the recall, Honda had issued the complete list of models affected. Check it out at Honda's press release page. Have You Said "Thank You!" to Your Teachers? Image via Wikipedia "Be proud, you're a teacher, the future depends on you!" That's the slogan I frequently see posted on the roof of public schools when I was still studying more than a decade ago. That time, the statement was meaningless to me for I am just an ordinary schoolboy to which every beginning of school year was marked with trembling knees because of my annual fear: a new teacher. But now that I'm already a grown-up individual, had already finished my studies and is now working on a profession I chose. When I look back and recall those words though, I now see it in a different light. It make sense. Yes to most of us, teachers played or will play a crucial role in our life. They were our second set of parents. Our teachers were frequently among the primary source of our understanding about our world. They were among the first ones to inspire us and help us discover and improve our abilities. The honest answer is: I don't know. 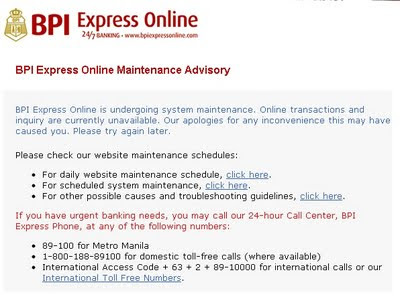 Yesterday, all BPI branches were OFF. All banking transactions were halted starting around 9AM. I was able to do my banking activity around 5PM already. When I asked the clerk how long does it usually take to restore their system, she just simply said, she don't know because it varies from case to case. Yesterday's incident may or may not be related to today's offline mode but it is safe to assume that it won't be restored as quickly as we think it is.